New headlights, no more film! Just got back from the dealer after getting new R and L headlight assemblies installed at no charge. Yay!! No more nasty film. Hopefully these new ones will not develop the same condition. Neither the service manager nor the tech could positively identify the origins of the "goo". I'm thinking something to do with the manufacturing process. Oh well, I'm happy now. For those of you with the same problem, take it to your dealer and have them replaced. It didn't take too much effort to have them cover it. All I did was ask. I have 13,300 mi and have owned her since Feb. '04 so, it was outside the 12,000 mi/12 month window. But, they did it anyway. I was in today for the N Flash and the headlight film. They looked and then ordered me new ones. I read somewhere that they changed the manufacturer they were using. What exactly is this "film" you speak of? My headlights ('05 with 5500miles) has a very, very slight "haze" to the lights, is that what you mean? Just asking so I know what to look for. It looks like moisture build up on the inside of the headlight lens that never goes away! I took my car to my dealership and they replaced them as well. No questions asked, they said it's under warranty and did it. I just turned over 13K miles....I've had this film on mine, but didn't know I could have it replaced...will they still do it? I think I may have it, but I'm afraid of screwing up the alignment of my headlights, so I think I'd rather just live with it. I can't imagine them getting it exactly right and if they didn't, it would drive me absolutely insane. Wait, 12,000mi/12 month--What part of the warranty are you referring to? I thought our warranties were 50,000 mi/5 years? To me it looks like moisture, or an oil film. You'll notice it more at night when the lights are on. I think the composition of the plastic is being affected by the heat of the HID lights. Hopefully it's true that they replaced the supplier. The dealer knows of this problem on earlier builds and replaces it no questions asked. Just make sure it's film inside the headlights and it does look like haze. Had mine changed last year. No problems so far. Our warranty is actually 48 month/50,000 miles. What I was referring to was the 12 month/12,000 miles "service adjustment" period. What it basically says is within the first 12 months/12,000 miles the dealer will make any repairs or replacements not normally associated with warranty-type issues. 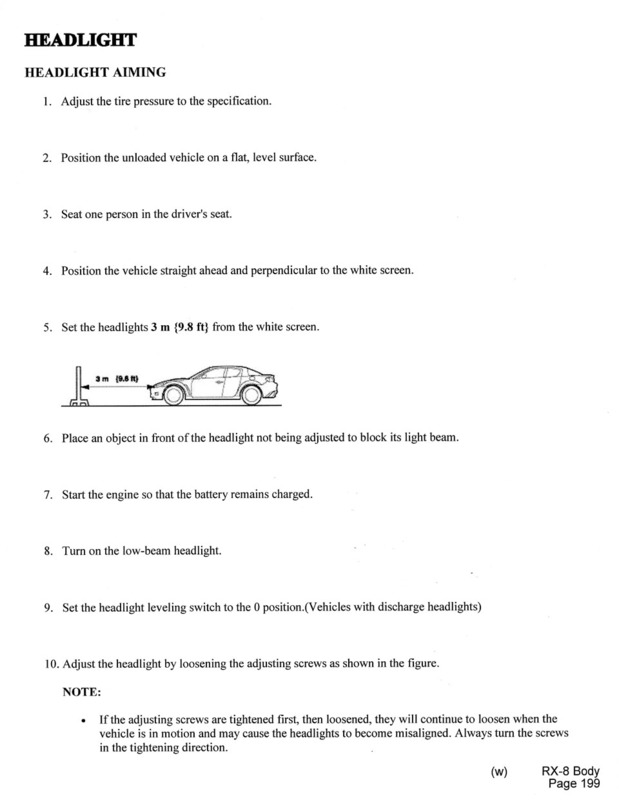 Such as alignment, headlights, etc... Basically, for the first 12 months you're covered against manufacturing defects, which is what this headlight issue falls into. I also had my entire drivers seat replaced within the first year due to the mounting hardware always coming loose. Normally that would be considered "wear and tear" but, within the first 12 months it is covered under the "service adjustment". If you look on page #9 of your warranty information supplental booklet that accompanied the owners manual it will give a description of what I am talking about. Not that I'm aware of. Complain enough and they should take care of it. lmao...I had my headlight assemblies replaced about 2 months ago for the film. The first time I drove at night I could barely see 5 feet in front of me. I took it in and they adjusted the lights. Next time I drove at night I could hunt squirel from either side of my car. I was lighting up road signs from a half mile away. I've been tweaking them off and on my own now and just about have them back to the way they were. Mine is 9 or 11/2003, I can't remember and mine has the film. So May 2003 may have it also. I see that some people claim their headlights were not aimed properly after the lenses were replaced. Does this pertain to HID or the standard lights? I thought the HID are self leveling, therefore the adjustment corrects itself and aiming is not necessary. I took mine in to the dealer in November 04 to have them do something about the headlights and nothing was done. THey just notated it. Also, how can you make the headlights adjust? I would like to see it. That is what they did to mine when they replaced the headlight lenses they told me that there is no way to align it and I have base model I'm surprise even with the Xenon lights are having problems. I took it back again to have them align it its better but its like cm's off which is no big deal when I have time I'll do it myself. After they replaced my headlight lenses the second time I took it there they voided my lighting system lol since they found out I have aftermarket HID's but oh well they replaced my headlight lenses yay!! 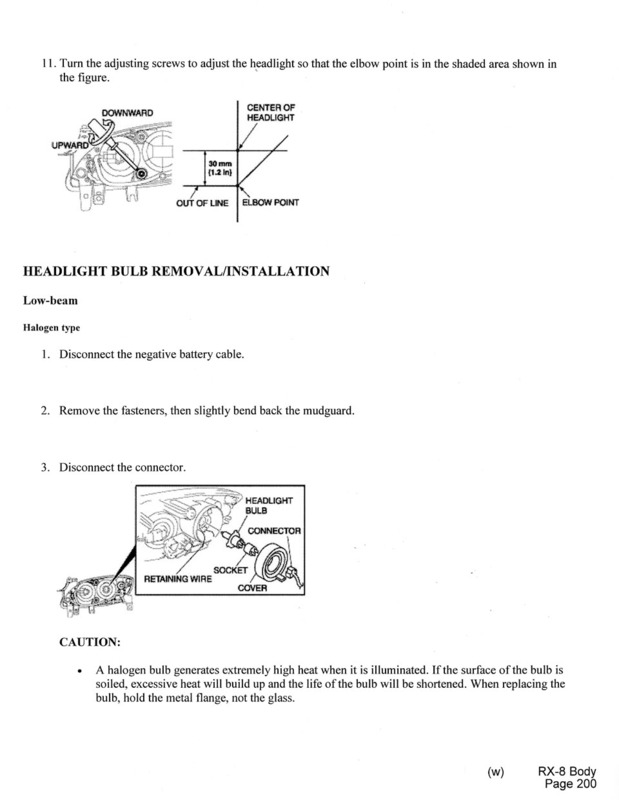 Here are the pages of the shop manual that deal with aiming the HL's. 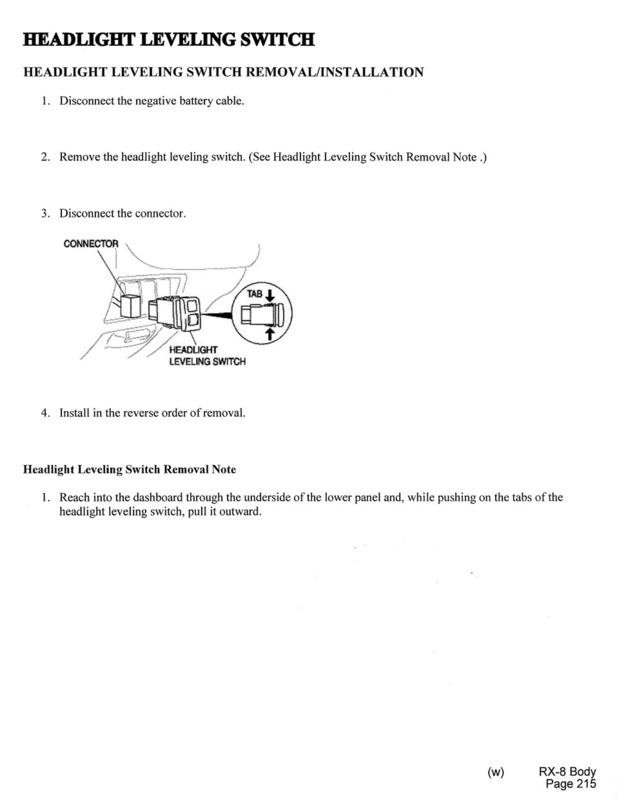 The reference to the HL Leveling Switch is a bit curious, because they are apparently referring to the dashboard light dimming switch (see the page identifying this switch). That is curious..the switch in the third picture looks like the Mz3 hid adjustment. Quick Reply: New headlights, no more film!